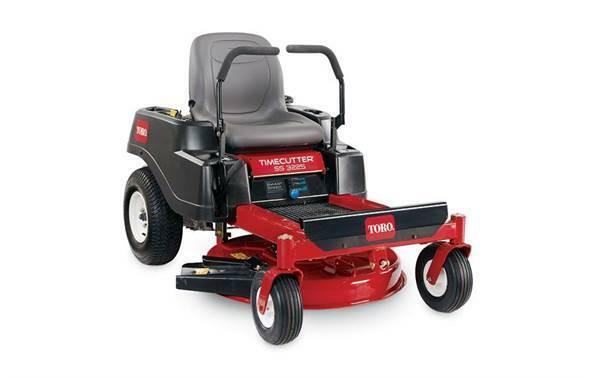 The TimeCutterÂ® SS3225 zero turn riding mower is powered by a premium ToroÂ® 452cc single-cylinder engine. It features a compact 32 inch wide, 4 inch deep, top discharge deck design with convenient washout port. An 18 inch extra-tall seat provides a smooth and comfortable ride. You'll find it easy to maneuver in tight spaces, plus the exclusive Smart SpeedÂ® control system allows you to choose from 3 speeds giving you greater control when trimming, towing attachments and mowing. Smart SpeedÂ® Control System has three ground speed ranges (Trim, Tow, and Mow) giving you greater control of speed and maneuverability for cutting grass and pulling attachments). 32" (82 cm) Mowing Deck: Toro's four inch (10 cm) deep, top discharge deck design provides superior cutting performance in all conditions. Create your own natural fertilizer by adding a Recycling KitÂ® or make yard clean-up a snap with an optional Twin Bagging system. Smart SpeedÂ® Control - Trim, Tow, Mow: Toro's Smart SpeedÂ® control system lets you choose from three ground speed ranges for optimal performance. Use low TRIM range to trim closer for maximum time savings, choose medium TOW range for towing attachments, or select high MOW range to mow large open areas and finish quickly. Recycler Kit: Cut more grass in less time and improve the health of your lawn. Toro's innovative RecyclerÂ® mulching system minces grass clippings into fine particles and puts them back into your lawn giving you a healthy, lush looking yard.